Recently, I’ve encounter the problem of finding a template in an image, which is a common issue in image registration or computer vision. 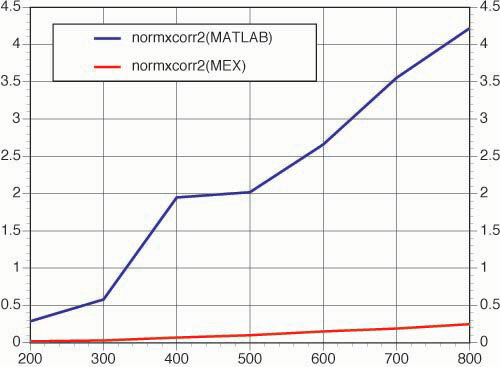 With the built-in function “normxcorr2″ in MATLAB, it is rather easy to write a program to do this. However, the performance is not that great. By wrapping the C++ code from OpenCV project and making it available as a MATLAB MEX-file, Daniel claims that he achieved a huge performance boost. I was a bit suspicious at first, but decided to give it a shot. As I am using a n Apple PowerMac G5, I found out that I need to compile the MEX-file on Mac OS X, which turns out not be a trivial task (see my dedicated post). Anyway, the outcome really surprised me. I can assure you now, that it is well worth the time and trouble to compile the MEX-file! The template stays the same (100×100 pixels), while the size of search image is increasing (from 200×200 to 800×800, indicated by the X-axis). The Y-axis shows the cpu time. 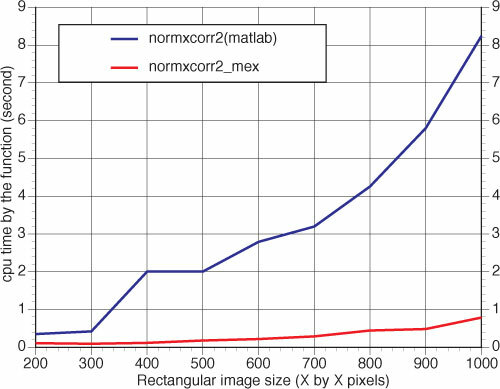 Clearly, there is a speedup of 15x – 20x, using the compiled MEX-file over the built-in “normxcorr2″! You are currently browsing the archives for the MATLAB, LABVIEW category.